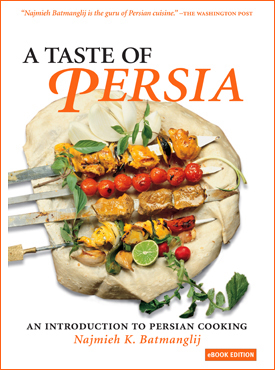 A Taste of Persia is a collection of authentic recipes from one of the world’s oldest cuisines, chosen and adapted for today’s lifestyle and kitchen. Here are light appetizers and kababs, hearty stews and rich, golden-crusted rices, among many other dishes, all fragrant with the distinctive herbs, spices, or fruits of Iran. Each recipe offers clear, easy-to-follow, step-by-step instructions. Most take less than an hour to prepare; many require only a few moments; many others can be made in advance. Besides its 100 recipes and 60 photographs, the book includes a useful dictionary of Persian cooking techniques and ingredients, a list of specialty stores around the nation that sell hard-to-find items, and a brief history of Persian cookery. Together these make a complete introduction to this wonderful cuisine. The Atlantic Monthly’s web site ran a feature on A Taste of Persia. Most of the recipes in this book would have been at home in Safavid Isfahan, although Iranian cookery has developed since then, of course, and added ingredients, such as tomatoes and potatoes from the New World. There are regional variations as well: People around the Caspian and on the Persian Gulf have their own styles of fish cookery, for instance. But certain basic themes remain. There are many yogurt-based dishes, called borani after a Sasanian queen who enjoyed them; these are a heritage, perhaps, of the centuries Iran shared a culture with western Asia. There is an emphasis on fruit, as might be expected from a country so rich in it. Fruit is often combined with meat, to make sweet and savory dishes or sweet and sour ones. Iranians love their distinctive rice dishes, their chelows and polows; in fact, we judge a cook’s ability by them. Besides that, Iranians share attitudes toward food. First, it is part of hospitality, which is central to Persian life. Hospitality must be generous: In traditional Persia, a host would remain standing, serving his guests and eating nothing himself. Customs change, but the attitude remains. Hospitality is like gift giving, the saying goes: One should do it handsomely or not at all. Next, one should cook according to what is best in season, so that food is as fresh and of as good quality as may be. Fragrance, both during cooking and at the table, is almost as important as taste. And food should be presented handsomely, garnished so that it pleases the eye. Then there is the ancient philosophy-linked in time and thought to the dualistic Zoroastrian religion of the Achaemenids and Sasanians-of hot and cold foods. It is a philosophy Iranians once shared with most of the civilized world, including China and India and the medieval West, where it was called the Salerno Regimen, after the city whose physicians taught it. It still affects the way foods are combined and served. The philosophy rests on the belief that the body reflects the elements of earth, air, fire, and water in humors-blood, yellow bile, phlegm, and black bile. These should be in balance: If they are not, illness results. Proper diet is the way to bring the humors into balance. Foods are classified as hot, cold, wet, and dry, measurements not of temperature but of energy. Hot foods are high in it, cold foods low. The classifications vary from region to region, but generally speaking, animal fat, poultry, mutton, wheat, sugar, some fresh vegetables and fruits, and all dried vegetables and fruits are classified as hot; most beef, fish, dairy products, rice, and fresh vegetables and fruits are classified as cold. If you have a hot nature or a hot illness or it is summertime, you should be eating cold foods; if the weather is cool, or you have a cold ailment or a cold nature, you should be eating hot ones. The everyday ideal, though, is balanced dishes, suitable to the occasion. That is one reason you will almost always find walnuts, a hot food, in dishes that include pomegranates, a cold one; or tart cherries with poultry. Another reason, of course, is that those ingredients taste absolutely wonderful together.